Use the recipes and strategies in this unique cookbook to help you save time and money. Over 200 pages of recipes with clear, detailed directions will help your cooking earn rave reviews even from picky eaters. Award-winning cookbook author Amy Houts shares her time-tested, proven method of intentional planning to provide delicious, home-cooked meals and spend fewer hours in the kitchen. Amy’s method, where one dinner becomes the basis of two additional meals, works. Each meal is completely different, so different that no one will guess they are eating leftovers. And with little food waste, you save money, too. Multicultural recipes in “Mealtime Magic” represent the melting pot of the USA. You will find typical American fare such as, Chicken ‘n Dumplings, Beef Pot Pie, and Philly Cheese Steak Sandwiches. Italian dishes include Easy Lasagna, Betty’s Spaghetti, and Meatball Heroes. Cheesy Chicken Quesadillas, Nine-Mile High Tostadas, and Stacked Enchiladas con Huevos will please Mexican food fans. 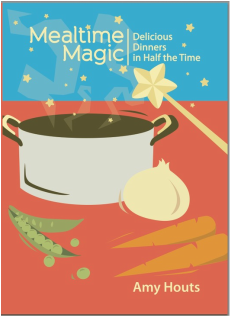 “Mealtime Magic” wouldn’t be complete without the delicious flavors of Asian Pepper Steak, Pork Fried Rice, and Hot & Sour Soup, plus much, much more. Recipes use ingredients from in your pantry or local grocery store. A semi-concealed spiral binding allows for easy recognition on the bookshelf and easy reading while cooking. "It is a really unique and intelligent approach to a cookbook. I'm sure it took a lot of research and thought. And the layout is very readable." -- Bernice F., New York. "A clever cookbook (and more) that is smart and uniquely designed. Recipes are versatile and delicious, thanks to Amy's many talented skills! Her hints and tips throughout her cookbook are a life-saver to the busy cook in a very busy time!